My diligence on keeping my blog updated has been waning as of late. I can easily blame it on work, plus I am possibly the world's worst procrastinator. But since my blog has evolved into mostly a running sounding board, I haven't really had any hoorahs that I wanted to write about. But Honey Badger. 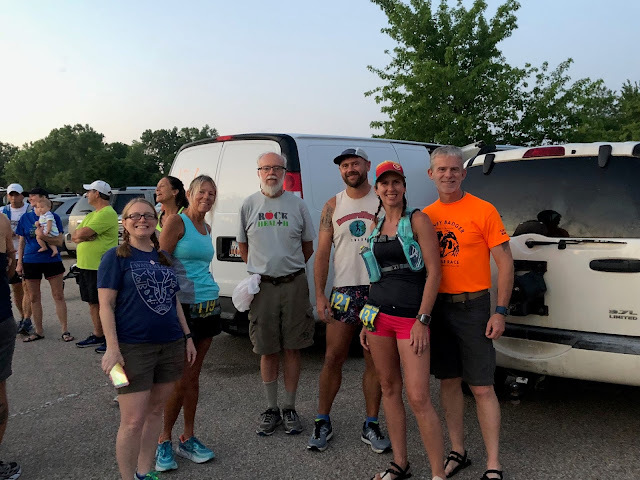 Mitch and I crewed and paced Lynna at this race two years ago, and for a race that is touted as being tough, even to the point of proclaiming it to be the mid-states version of Badwater, "I" thought it was an easy race. The only two things that made it harder than a cake walk was that it is all on pavement, and it is in July when it most likely will be hot and humid. I, being quite acclimated to the heat, decided to give it a go. I even trained a little for it. 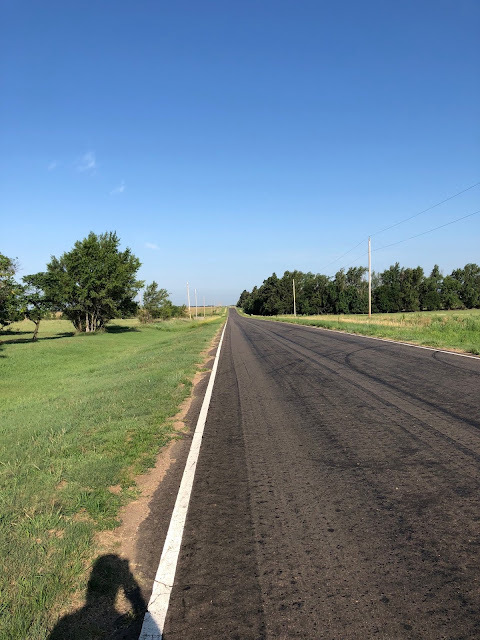 I had a 2-day running streak, I ran a few long runs in the 20-mile range on pavement. 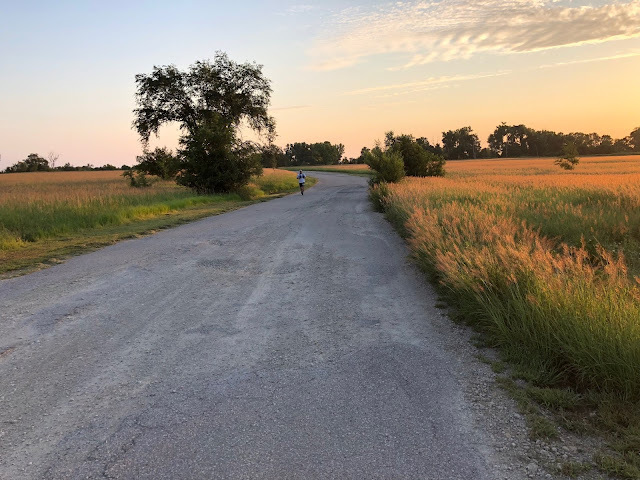 I ran a gravel 50K in March, a mostly gravel 50-mile in May, a couple of halves and a full sprinkled in there. My ever-present knee thing was behaving--not 100% but a solid 80%. Lynna was running the race again and had her eyes on a USATF women's age group record which she would earn by finishing this race. For the record to count, the course had to be certified by the USATF, and most 100 milers are not certified. Lynna had ample crew support, and so did I. We thought we would at least run some of the way together, but I knew that she would be too fast for me in the early going, and if I happened to catch up, we would likely run together for a while. I ran a 20-miler the weekend before at the Midnight Madness event in Tulsa. I had a good run but decided since the course was 1/4 of a mile from my house, I would run home and get my dogs and run with them on an out-and-back. Bad idea. They were happy about getting u at 5:00 am for a run and were amped up about getting a rabbit chase in the wee hours of the morning. Sure enough, there were rabbits on the trail and they bolted after one on the steep downhill from the Turkey Mountain parking lot. I put on the brakes and held them, but I should have let them go. I jammed my bad knee for 3-4 long strides and was hurting a little from that point on. I took them back home and proceeded to finish the last 405 miles of my race. I was running intervals--100 strides at a quick pace (about 10 m/m), 100 steps power walking, and 100 steps shuffling. My power walking was about 30 seconds per mile faster than my shuffle, which seemed odd. 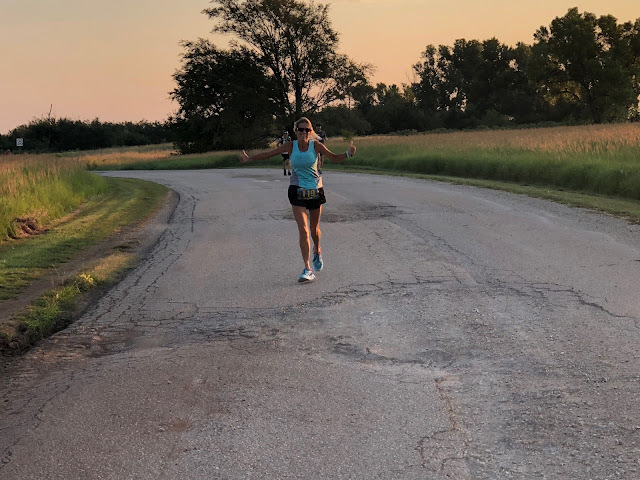 About a mile from the end of the race, I stopped to chat with a runner coming back the other way, and when I resumed my forward progress, I couldn't put any weight in my right leg. My knee and hip hurt really bad--like my body weighed 1000 pounds. When I lifted my foot, then my foot weighed 1000 pounds. I really thought I was gonna have to call someone to pick me u, but managed to tough it out. After the race, I went home, showered, took a pain pill and crashed in the easy chair. When I woke up, my body and/or leg didn't weigh 1000 pounds anymore, but I was still tentative in my walking. 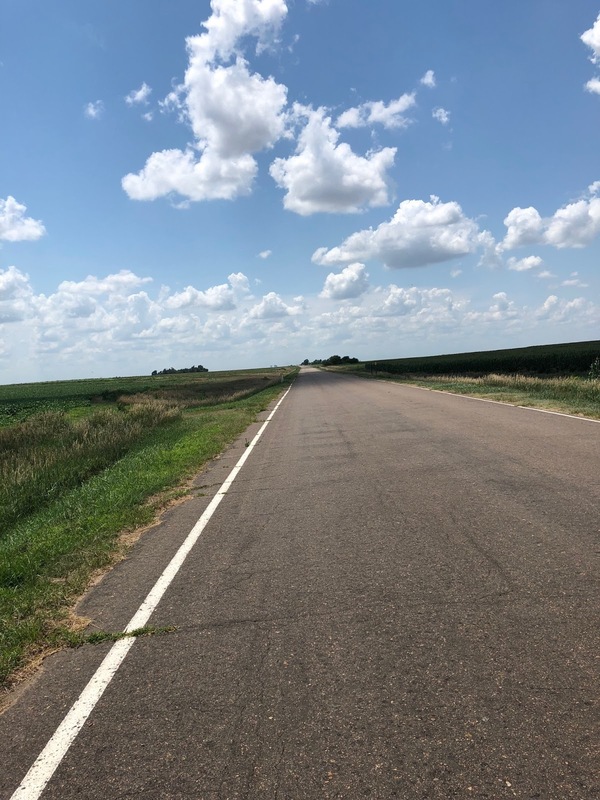 I worked my normal work week and things seemed better, but I really had my concerns with 100 miles of asphalt at Honey Badger--but I still went. Johnna came with me to crew and pace, and David West also drove up to help out. Starting the race, I felt fine. The temperatures were supposed to be a little on the cool side, but low 90s was still a possibility. I ran the first 10 miles or so at a comfortable pace--I was in last place, but still well within the pace I needed to run. Plus, I was slowly catching up with a runner. Left to right: Johnna, Lynna, David, Matt, Eva, and Jbob. matt was running and finished. Eva, who finished last year, broke a bone in her foot and had to drop. Jbob was Eva's crew. The race started at 6:00. It was not hot yet, but very humid. We ran through the roads of Cheney Lake Park and got around 6 miles in before heading out on endless straight roads. I saw Lynna on this out and back and could see she was setting a good pace. I used one of my ultra-secrets--tossing out a Facebook post beckoning prayers and positive thoughts. This garners lots of comments of encouragement and can keep my drive to push onward intact. 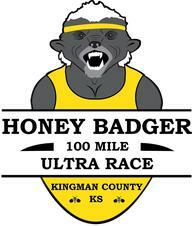 "Honey badger 100. I am 3 miles in and feeling really good. I’m about 300 yards out of last place. But things are A-OK, and I am enjoying life. Please think of me today, I appreciate prayers and all the positive thoughts and vibes she can send my way." 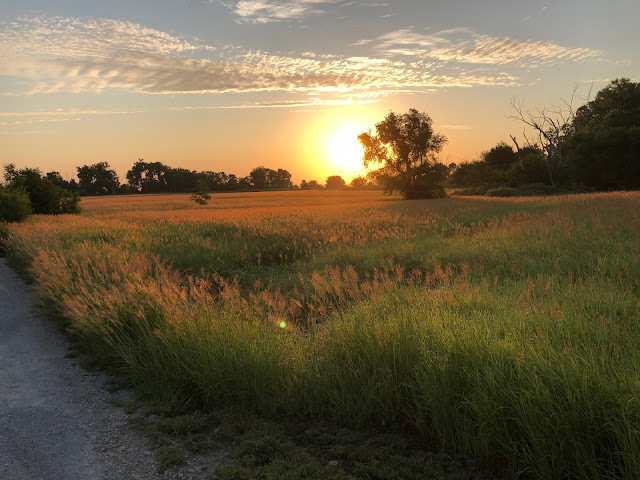 While I do love the mountains, the flatlands of Kansas has its appeal. But that appeal dwindled as the day went on. Johnna and David met me every 3-4 miles and gave me snacks and Pedialyte. (I am a real believer with generic Pedialyte. It is so much better than Gatorade there is no comparison.) I had brought a wide variety of food--pro-bars, boiled eggs, stuff for salomi and mustard sandwiches, cookies, little containers of strawberries with chia seeds (AWESOMENESS), Fritos and Pringles, chocolate milk, Starbucks coffee drinks, and I am sure I am forgetting about a dozen other items. Once out of the park, the course turned west. Straight west--as in no turns, no curves. I was pining for some sort of curve in the road but there was none. Twenty miles later. Same road--but wait!! There is a SLIGHT curve in the road ahead!! I did catch the runner ahead of me. He was in his 70s, and from Wisconsin--where they have no humidity. He was melting down and eventually dropped at about 26 miles into the race. (No pride in passing a 70-year old who was overheating.) Still, I was averaging 16-minute miles, but at about mile 27, I started slowing down. Nothing hurt (I dod have the beginnings of a hot spot) but I could not make myself speed up. I could do maybe 50 strides faster, but then I just had to slow down. That's when I started doing runners math. I had to get to mile 53 by 16 hours--basically an 18 minute per mile pace. 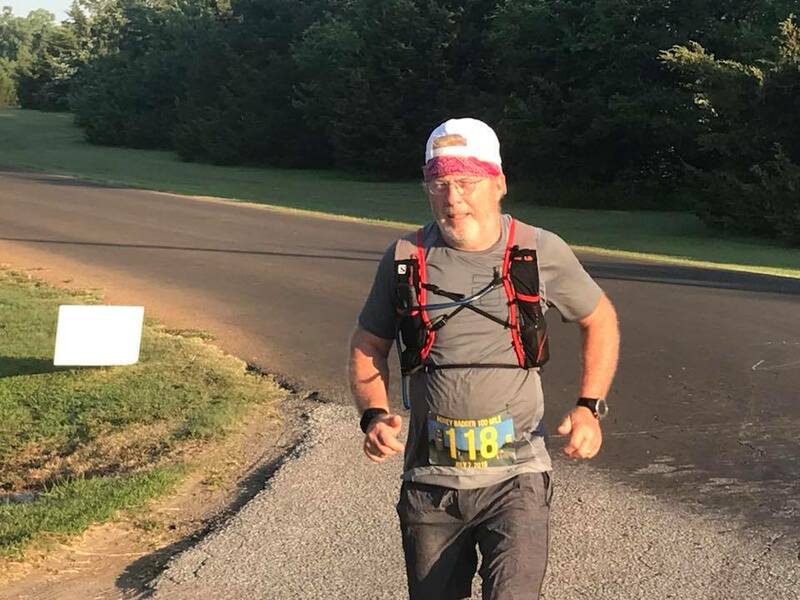 I was losing my time cushion, and I knew that by mile 40-45, My average pace would have dropped below 18 minutes per mile. It didn't help that the sun popped out from behind some clouds and beat down hard on us poor runners. we also lost a good south breeze that made things bearable. At mile 34, I pulled the plug. I went back and forth on the decision. Gradually, I was starting to feel the pain in y knee. If it turned into what had happened the weekend before, that would surely end my run. And by my fuzzy math, I was correct in admitting I could not make the cut-off time at mile 53, and even if they let me go on, it would take a miracle for me to make the finish. We drove on to the 53-mile checkpoint and waited for Lynna to come on in. She looked great. She had purposely ran a spirited pace to put time in the bank, and by doing so, she assured herself of a finish. SHe did finish and has herself planted in the record books as the 65-69 age group record holder for 100 miles. She bettered her tie from two years ago as well. Getting another record once she turns 70 probably will not happen. It seems a runner named Helen Klein ran a 100-miler in 1993 on a certified coure in 21 hours and change. So where does my knee situation leave me? I have not rn much, but I have done a few 5-6 milers. I still have plans to run Tunnel Hill in November. I am waiting to decide on Urban Adventure in September. I am doing some exercises and stretching that is helping. I am seeing Lisa Butler once a week who is doing some intense leg smashing and deep tissue massage, and I am seeing good results fro that. I need to work some biking into my training, and that will happen. Yoga too, although I am not sure about those yoga pants.